Throughout Lancaster County, you will see many signs advertising Amish quilts. Authentic quilts from Lancaster County have become a very popular and sought after form of folk and Amish art. 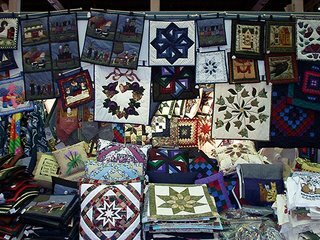 Even though many non-Amish people do use these quilts to keep warm at night, an appreciation of the creativity that goes into their construction has led many admirers to hang them on walls as decoration. Early quilts were made from the most practical means. Originally the quilts were made from any leftover fabric that remained after the clothing was made. As the textile industry grew in this country, new material was used. An enormous amount of work goes into making the quilts. Each piece of cloth is cut and stitched together by hand or by sewing machine. Quilt making is both a practical activity as well as a means of socializing and expressing creativity for Amish women. Amish quilts made in Lancaster County differ from those made in Midwestern states such as Ohio. 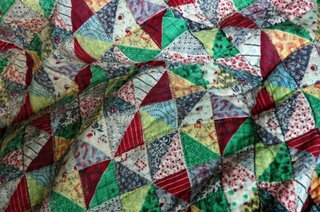 Lancaster County quilts generally employ large, geometrical patterns with distinct Amish designs. The Midwestern quilts tend to contain busier, patchwork schemes and feature traditional American designs. Furthermore, the Lancaster County quilts usually feature deep, rich, jewel-tone colors. The colors tend to be dark but black is generally not used. On the other hand, Midwestern quilts commonly use black. Generally, Lancaster County quilts which were designed before 1950 did not not employ imagery such as animals or buildings. However, today's quilts sometimes do feature imagery as well as lighter colors which tends to appeal to the non-Amish admirer. If you're interested in learning more about Lancaster County's unique folk art during your visit, why not check out some of the best Pennsylvania Dutch Folk Art musuems where you and your family can experience firsthand this rich and complex and relatively unknown artistic culture.